Introducing the Indie Film Series! Starting this Friday, we’ll be featuring a different independent animated film every weekend. Tune in and watch with us as we review and discuss independent animation, from Akira to Balto to 9 and even to the Barbie movies. Our first film will be featured on Friday – watch it with friends this weekend sometime between the Annie Awards and the Super Bowl (or instead of the Super Bowl?) – and the full Rotoscopers review comes Monday. Each featured indie will work the same, giving you plenty of time to watch the film yourself over the weekend before reading our reviews. Follow along, watch the featured films, and hopefully we’ll help you expand your animation library. Join us this Friday, February 2nd, as we start the Indie Film series! 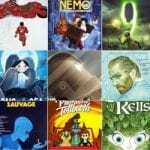 Have a favorite indie animated movie? Comment below!